Narrowing down the right store from the many carpet stores in San Marcos, CA, can be a bit confusing, as can be the choice of carpeting. Let us make it easy for you. Our local showroom offers you service, selection, and competitive carpet prices. Put yourself in the hands of our flooring professionals for a truly enjoyable shopping experience. 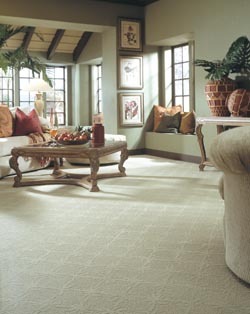 Professional carpet installation is absolutely essential for your new flooring to look beautiful and wear well. The results of carpet incorrectly installed is painfully obvious. The seams are visible, the fabric is wrinkled and bunched up, and the material does not stretch all the way to the perimeter of the room. These mistakes lead to damage from ripping, tearing and the expense of repairing and replacing the carpet. Carpeting that is installed properly looks seamless and plush with the nap running in one direction. When you shop for carpeting with us, we schedule a team of professional installers to come to your house for service. These experts have been laying carpeting correctly for many years and know tried-and-true methods, as well as industry best practices. Ensure that your new carpet looks appealing and last for many years with professional installation. Flooring your business with commercial carpet makes a sound investment. First, there is the appeal of carpet flooring. The inviting warmth and softness of fabric flooring make customers feel welcome. The colors and patterns can soothe or energize, depending on the needs of your business operation. Carpeting is also practical. These days, manufacturers make high-performance carpet, especially for commercial use. Synthetic fibers are treated with agents to resist stains and water, as well as to spring back into shape even with heavy foot traffic. We have a huge collection of carpeting in a wide variety of price points, all for use in your business. Of course, luxury carpeting is ideal for commercial use in executive offices and boardrooms. Natural materials, such as wool, are strong and durable and wear well under trying conditions. Plus, these natural materials make gorgeous fabric flooring that elevates the status of any and every room. Contact us today to help you find the ideal carpeting for your home or business. We proudly serve customers in San Marcos, Carlsbad, Escondido, and Oceanside, California, including ZIP Codes 92024, 92129, 92130, 92067, and 92028.